The skies were dark and the seas were a little rough. Tis' be unseasonal rain, I reckoned. I went back to the helm and looked at the map. It had been sent by a friend. Our destination for the day was somewhere nearby. From the corner of me eye, I spotted a small island. I knew that this had to be the place. I turned the helm and ordered the crew to drop the anchor. Together with the boarding party, I entered our destination for a food fiesta. Zapata, sounded a bit like a Mexican gangster to me but Google suggests that it was the name of a famous Mexican revolutionary. Famous enough to have places named after him. And more than margs and roads, mind you. Well regardless of the naming, I was quite intrigued about what was on offer. Zapata's is a newcomer to Mumbai's colorful and vibrant food scene. Its founded by Frederic(one of the Partners owning the restaurant) who is a suave man from France. I wondered why a person from France will open a Mexican restaurant in Mumbai, when his own native cuisine is world famous. He tells me that that he loves Mexican food and talks about its likeliness to Indian food. He is true on that. The hot and spicy Mexican food does remind me of Spicy Indian food. And I must admit that I have quite a liking to certain Mexican offerings. Let the game of Salsa and Masala begin. Hey You, Yes you ! You looking at me Amigo ? The restaurant has a small Bistro like appearance. The Al Fresco faces the road and has a pollution plus insect problem. But, one has to admit that it looks like a cafe right out of Mexico. When inside, the ambiance changes radically. Its calm, cozy and creative. Though it doesn't quite feel like Mexico inside, it does have a Tex-Mex feel to it. The Gangsta Sombrero Dog Mural is the first thing that one notices in here. The Aviators feel as they reflect but they don't. I am told that this art piece is incomplete and may get real reflection soon enough. It adds to the uniqueness of the dining area. Some Amigos may find it odd but I find it quite expressive. I met our hostesses Chandni and Purvi who were kind enough to invite me. I also met a motley group of fellow epicures from across the city. The sojourn kicked off with a Complexion booster drink. 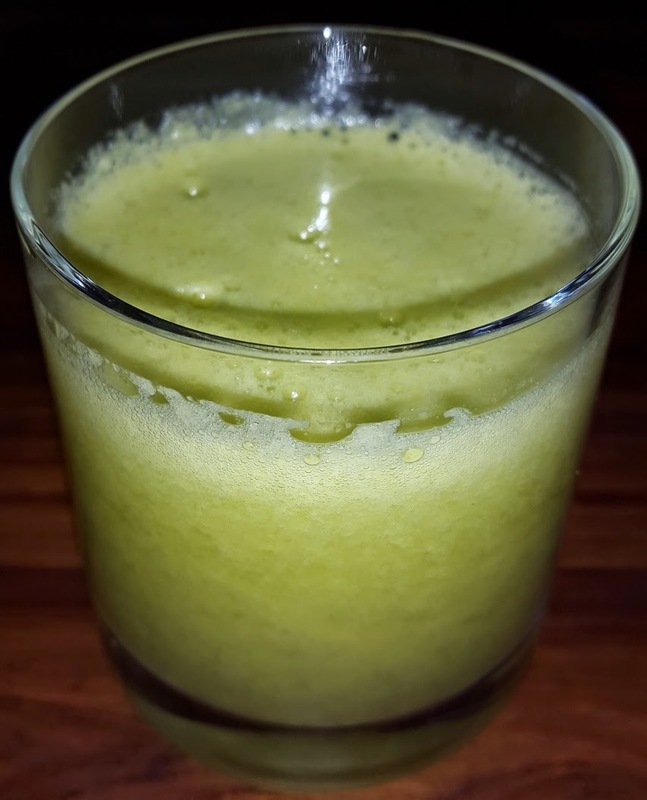 It was made out of Celery, Orange and carrots. Definitely healthy ingredients but the celery gave it a strange anti climatic bitter flavor. Needless to say, I wasn't very fond of it. Captain: Tell me Lad, do I look pretty to you? Crewmate: Are you feeling all right, Cappy? That aint even Grog. Captain: This drink is supposed to be good for me skin, not so good for me taste buds though. My main drink was a Mojito. This was a strong cocktail with 60 ml of white rum. It was Tangy, fizzy, strong and definitely a good accompaniment to the appetizers. Zapata's has a varied range of drinks as expected of such an eatery. I also think that my drink looked rather good in the picture. I feel thirsty just by looking at it. Captain : This contains Rum. Yes Rum ! Crewmate : Rum Rum Rum. Captain : Good grief, I really thought that my log would go without the mention of Rum. Crewmate : Wait, You have a log Captain? Are you recording our conversations for the world to see. Crewmate : Why did you wink? Hey ! Our food started with Nacho De Zapatas. There isn't much to complain or praise here.The presentation is excellent. It had been plated with dedication and Adrian Monk's precision. 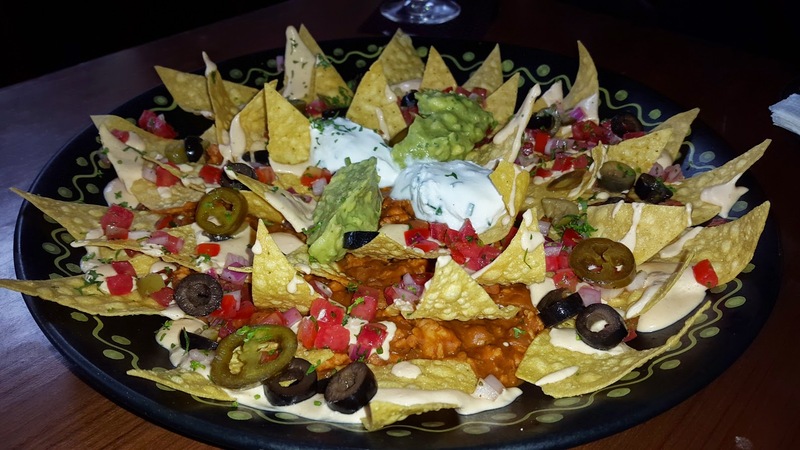 The nachos tasted nice with toppings of sour cream, olives, Jalapenos and guacamole. Despite being tasty, it felt a tad bit dry in some areas and I positively feel that I have had better Nachos elsewhere. In short, satisfactory but still requires some improvement. The Vegetarian Nachos variant appeared good on visuals but lacked taste. For Mexican food it certainly was bland. Needs a complete rework since bland food wont bode well with either Mexicans or Indians. We were then served with three different platters of Tacquitos. The first on the lineup was Braised Lamb Tacquito. I have got to say that the Chef has a eye for good plating. The Tacquitos appeared visibly enticing and this lamb variant was my favorite. These little morsels were very satisfying and it was almost a shame that they get over fast amongst a group. The Beer battered Fish Tacquitos were up next. This was tender Basa fish cooked in a spicy beer batter. To be honest, I am a little bored with Basa being the only fish in many Mumbai eateries but Zapata's take did give it an unique flavor. Imagine the flavors to be ribbons, the Basa ribbon and the beer ribbon spiraled around each other perfectly to give these a great taste. Had a great flavor and was a close second to the Lamb Tacquito. The Paneer Tacquito variant is not mentioned in the menu but is offered by Zapata's. This is good for the pure vegetarian types but felt a lot bland to me. It feels that they need to work on the spice content for their vegetarian variants. Was a distant third to the above two Tacquitos. Captain : Tri-colored Tacquitos. They look like treasures of the sea. Crewmate : Or a Flag? Captain : I like the red Tacquitos. Crewmate : I liked the Green. One has heard of French Fries, Freedom Fries, Piri piri fries and what not but this was my first encounter with Mexican Fries. It was a completely new experience. 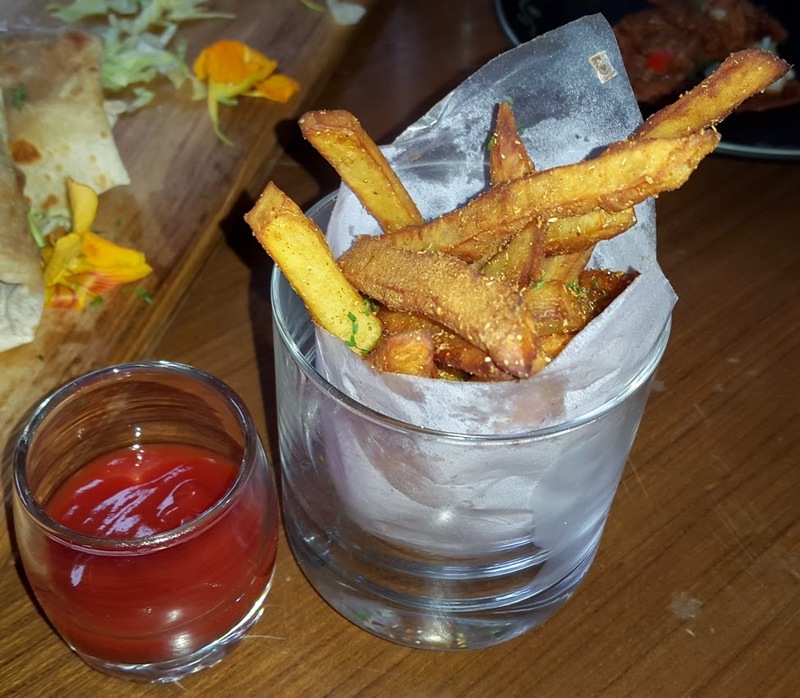 These fries were made out of sweet potato and wrapped in spices. These were deliciously addictive and went great with the provided sauce and Chipotle. My thanks to the chef for introducing me to Mexican Fries. Definitely an item to be tried out by taste trailblazers. Have these and forget the hay like fries you eat at fast food joints. The Chipotle Grilled Fish Burrito was definitely not as long as its name. The grilled fish tasted great but I felt that it could have tasted better had the chef gone a little low on the Tortilla. The doughy flavor overpowered the fish and ruined a perfectly good flavor within. The presentation was nice although the flowers in the platter felt a bit strange. Grilled Chicken Tostada - It looked nice and had a lovely aroma. However, it had a problem with flavor. The taste had not quite sunk into the meat. While there were no issues on the surface. The sauces, greens and spices were added appropriately. The problem began in the depths. It was simply made of flavorless portions of Chicken breasts. Even with the supplied salsas, I could not seem to get any flavor onto this. Left me a little disappointed. Captain : These look nice but taste like nothing. Crewmate : Maybe the cook made a mistake. Captain : Let's pass it to someone else. Crewmate : Hey, You winked again....Wait a minute! 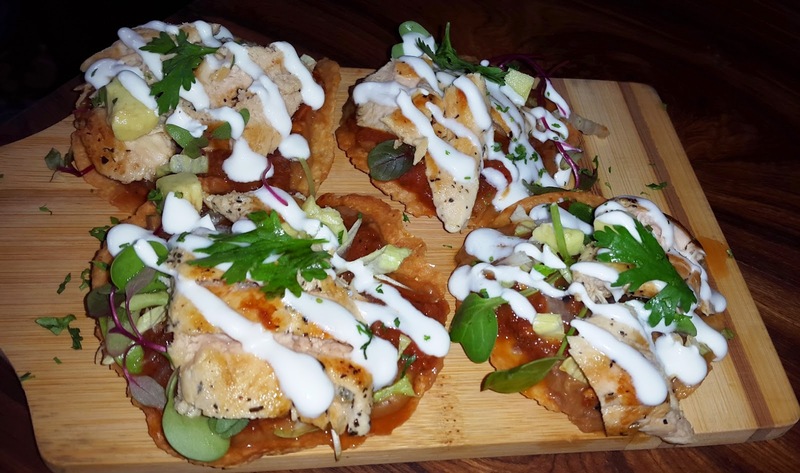 How did these Tostadas reach my plate? Spicy Chicken Quesadillas. 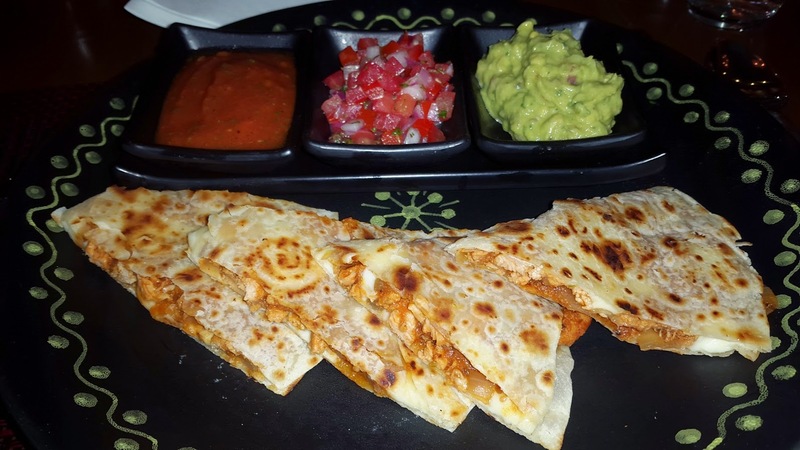 The Quesadillas were served as a part of the main course. These were full of soft tender meat and loaded with spices. The presence of melt in your mouth cheese made it flavorsome. There were no anomalies with the cooking. This was definitely the best item that I had at Zapata's. The only offset was its pricing which at INR 420 feels a little bit on the uppity side. But in merits, its definitely better than the Quesadillas that one eats at places like Taco bell or most other Mexican joints. As the sojourn reached its conclusion, we were served with a pretty dessert platter. It consisted of Tres Leches, Churros, Chocolate Empanadas and Zapata's Flan. The Churros were very ordinary. Too oily for my liking and lacked taste. Tres Leches(Or Three Milk cake - Far left in the picture with the Z symbol) was an absolute delight. It was made of cream, milk and condensed milk. I didn't sense much cake but I enjoyed the dessert just the same. The flavor of the condensed milk was the dominating one. With probably some hint of Caramel. Crewmate : Leches, Leches, Leches. However, my favorite dessert was definitely the Mexican flan. I am always confused between flan and Caramel custard. I am told that only a person of a Hispanic household can explain the exact difference. But to a lay person like myself this was a more condensed version of the caramel creme pudding. 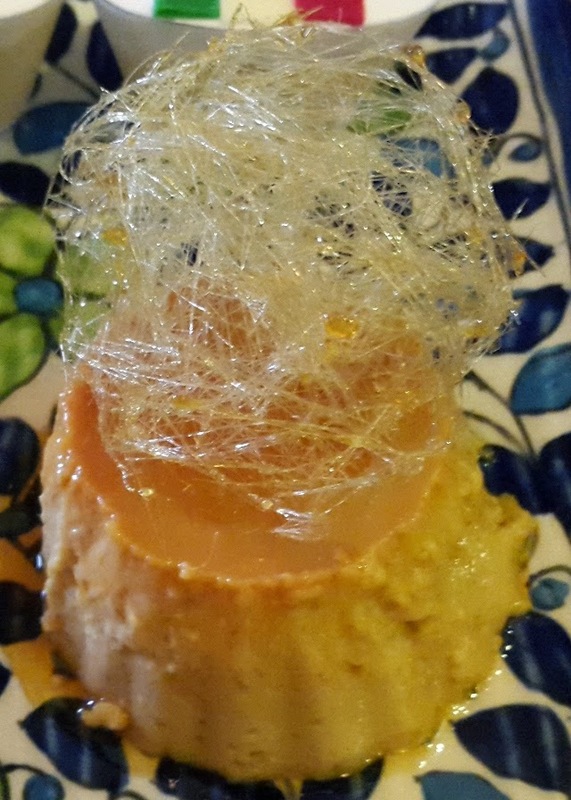 It did not have any fillings in it which a flan is traditionally supposed to have but I am glad that it did not. The flavor was rich in butterscotch and caramel and the consistency was great. I myself cook Caramel Custard at home sometimes and I can definitely attest that Zapata's Mexican Flan was far superior to that. Crewmate : Captain, I was sure that there was flan in this platter. Captain : Oh, Was there? You must be mistaken lad. Crewmate : There is flan on your sleeve Captain. You had it all, didn't you? Captain : Uh..No, this is probably some salsa. Crewmate : What's with the winks? 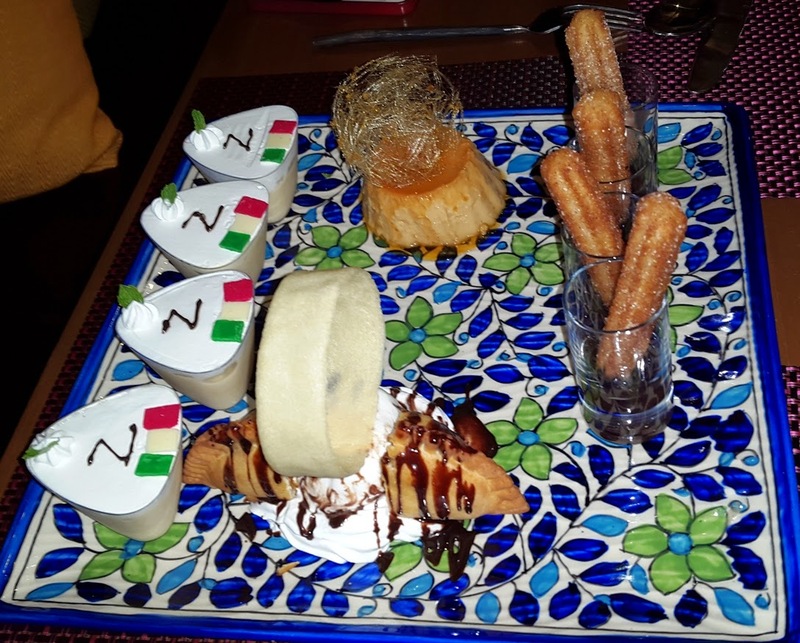 The service at Zapata is top notch and the executive chef Chinmay definitely looks like an experienced traveler. He was humble when he took feedback from our group. There were a few hits and a few misses. Such is life and I am pretty sure that an experienced Chef like Chinmay will take care of the misses. The pricing scales could be tipped on the higher side. Though some items completely deserve the pricing, some others do not. To conclude, I will add that Zapata's has only been operating for a little under two months at the time of this post. It is a nice eatery in an area dotted with restaurants. However, it faces a tough challenge ahead with likes of many other Mexican power houses like Chili's. It needs to fix the glitches and perhaps add more to its menu to make itself unique. 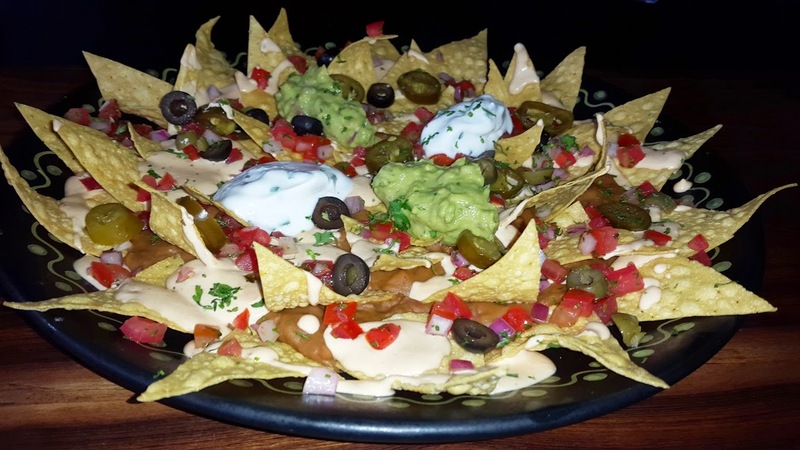 If you are in the Malad Linking road region, Zapata's is definitely worth a try. It is one of the better restaurants here. "All right ya lazy lads, yer bellies be full. We have a rough sea ahead of us. Time to get some action going. Until next time." A rocker of a review. Your attention to detail is amazing. The way you have described each and every food gives a precise picture of what to expect when calling for it. Way to go.